From first look on my blogs, if you didn't know me, you might think that Cameron was my favorite child. Seems like I am constantly putting up pics of him .....I in fact do not have a favorite child, however, Cameron is just the one in my family that is constantly either getting into something or doing something really cute. He is at that age right now, I guess! The other night for dinner, I made an ice cream cake (which of course included lots of chocolate inside) and by the end of dessert, he was wearing most of it. I know a lot did make it into his mouth, but you really couldn't tell that by looking at him! 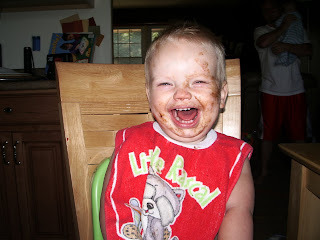 Shane and I just laughed harder as dessert went on and he kept getting messier. It really was so funny. These pictures really don't do justice to how dirty he really was! 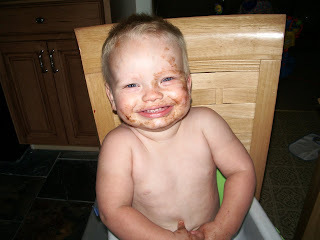 I thought it was cute when I read the blog of a friend of ours who said, talking about her own almost 2 year old, "I don't always know what he gets into...I just know he is constantly dirty!" ....and that statement reminded me so much of my Cameron. 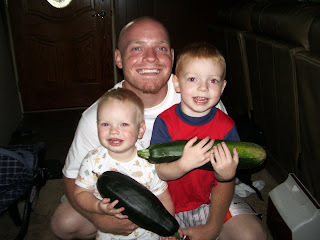 Here is a shot of the boys and Shane from last night....we went and picked the first zuchinnis from our garden, and it was really exciting! Now all the baking begins! I will bake zuchinni bread all summer long as the zuchinnis grow and then freeze the loaves, and we eat off of them all year! It is one of Colin's favorite treats...."Can we have keeny bread today?" he will say. :-) Gardening really is hard work--lots of things involved, and I really don't know that much of what I am doing yet--but it is so neat when you get to pick your own fruits and veggies. This year we did tomatoes, green beans, bell and jalepeno peppers, lots of fresh herbs, and even sweet corn! I am really excited for that one to be ready. We also have a giant raspberry bush in our backyard from the previous owners that has been so fun to eat off of--the boys just get such a kick out of picking them and popping them into their mouth (while unsuccessfully trying so hard to avoid the thorns! They are both so scratched up from "helping" me pick!) Yesterday, Colin was absolutely covered in raspberry stains after helping me pick them, but he was so cute. He kept saying, "Ouch! Watch the prickles!" I know more ended up in his mouth than in our basket, but such is life...we really enjoyed ourselves! Hey! what do you guys got going on for the 4th??? I hope you don't mind, I've been going back through your blog getting to 'know' you better! I grew tomatoes this year, I would really like to try my hand at zuchinni, was it easy to grow? I guess saying we live near Chicago is relative... we are closer to Chicago than to Indianapolis. We live in NW Indiana and we are about 45 minutes from downtown. We would kinda be considered part of the South Suburbs I guess.